In celebration of Father’s Day on June 18, Enchanted Kingdom (EK) treats our beloved dads to a magical day out. 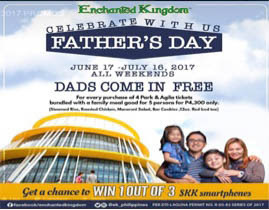 EK pays tribute to all fathers who deserve to spend a day of enchanting moments with his family by offering DADS COME IN FREE promo. Check out this fun-filled treats from the county’s premier theme park and create a perfect day to let your dad know how much you appreciate him. A perfect Father’s Day gift is a fun day where they can enjoy worry-free bonding moments with the family. EK offers a special promo where DADS COME IN FREE for every purchase of 4 Agila and Park tickets. The package, which is worth P4,300, is inclusive of a group meal for 5 at the Amazon Grill and a raffle entry for an SKK smartphone. This magical treat is available all weekends from June 17 until July 16 only. Enjoy an exciting afternoon of science, technology, innovation and creativity with EKstra Special Daddy & Me Robotics Class at the Boardwalk Party Place. Available sessions are 3:00PM and 4:30PM. Get ready for fun activities, games, and exciting prizes. This event is in partnership with Felta and Lego Education Philippines. 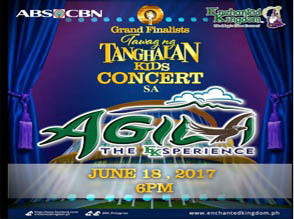 Catch the winners of Abs-Cbn’s “Tawag ng Tanghalan Kids” as they perform an extravagant concert at Enchanted Kingdom on Sunday June 18, 6pm at the Agila Grounds. See the First Grand Champion Kid Jhon Clyd Talili of Surigao Del Sur live on stage with his vocal prowess together with the finalists, Keifer Sanchez, Mackie Empuerto, Sheena Belarmino and Francis Concepcion. The runners-up namely, Sidro Quilicol, Shaina Allaga, John Jamiel and John Ramirez will also take part in the musical concert. Don’t miss this chance to witness the power of vocal greatness. Dads will surely enjoy a magical day at EK, where they can spend a day of thrilling adventure and bring home more enchanting memories!